Lando Norris will become the youngest Formula One driver in British history after landing a drive with McLaren. Englishman Norris, who only turns 19 in November, will follow in the footsteps of Lewis Hamilton by joining Britain’s most successful team as a rookie next season. He will replace Stoffel Vandoorne, who McLaren confirmed yesterday will be leaving at the end of the year after an underwhelming second campaign. McLaren wanted to give Norris a second season in Formula Two, F1’s feeder championship, but they were forced into an early promotion after Fernando Alonso announced last month that he will be retiring at the end of the year. Norris will now team up with the 23-year-old Spaniard Carlos Sainz, initially brought in from Renault to partner Alonso. Norris has been in the McLaren car in recent practice sessions at the Belgian and Italian Grand Prixs and has impressed. Hamilton was aged 22 when he burst on to the scene for McLaren at the season-opening 2007 Australian Grand Prix. Jenson Button was given his big break by Williams when he was just 20 at the turn of the century, but Norris will now eclipse them both when he takes to the grid in Melbourne on 17 March. “To be announced as a race driver for McLaren is a dream come true,” Norris, from Glastonbury, Somerset, said. McLaren had made moves for Ferrari’s Kimi Raikkonen and Daniel Ricciardo from Red Bull. Zak Brown, the McLaren CEO, also claimed at last weekend’s Italian Grand Prix that the Force India duo of Sergio Perez and Esteban Ocon were under consideration, too. American Brown added: “We believe Lando is an exciting talent, full of potential, who we’ve very deliberately kept within the McLaren fold for exactly that reason. Norris could be joined on the grid by another young British driver, George Russell, who he trails by 22 points in the F2 series. Russell, 20, is on the books at Mercedes and team principal Toto Wolff is keen on moving him to Williams. Norris was signed by McLaren last year after impressing in the junior categories of motor racing. 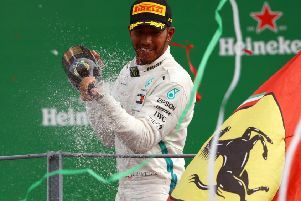 He then won the prestigious Formula Three championship with two rounds to spare before he was promoted to the role of reserve driver with the British team. 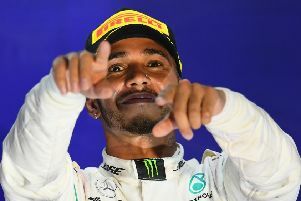 Hamilton, who moved 30 points clear of Sebastian Vettel following his sensational win in Italy, also won the F3 championship back in 2005 before making his debut for McLaren two years later. Norris will take the identical path. “For the remainder of 2018, my focus remains firmly on the Formula Two championship,” Norris added.